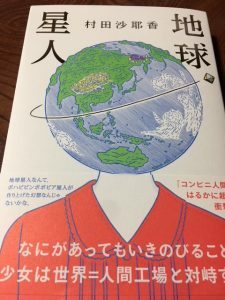 Started reading Sayaka Murata’s (村田沙耶香）latest novel 地球星人 . Literal translation of the name is 地球 = Earth 星人=Person from the planet. Interesting combination. The book was published last week, so only available in Hardcover. Not sure why it is not available in Kindle as previous one. Looking forward to it, as I enjoyed her last books and the way she looks at our lives, social standards.